Glamorgan fast bowler Michael Hogan has been reappointed as County Championship captain for 2018. The 36-year-old will share Glamorgan's captaincy responsibilities next summer with batsman Colin Ingram, 32. Hogan will continue to captain the side for four-day matches while Ingram replaces the retired Jacques Rudolph as limited-overs skipper. Australia-born Hogan took 50 first-class wickets last season and helped Glamorgan to T20 Finals Day. "It was an honour to have the interim captaincy last season but to be told by Hugh Morris [chief executive] and Robert Croft [coach] that I'd be captain for the full season, it was a huge honour," Hogan told BBC Sport Wales. Hogan admits leading a side has been a big learning curve for him. "Managing different personalities has always been a tricky sort of one for me," he explained. "I think I'm quite blunt, black and white, some people don't really respond to that, it's trying to manage different characters." 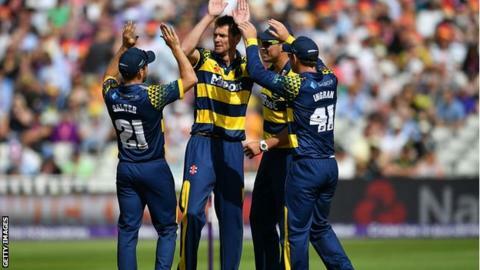 Glamorgan finished seventh in the Second Division of the Championship, and Hogan says that a lot of hard work will be going on in the next few months to ensure a better campaign. The first target is to secure a replacement for Rudolph as next season's overseas player. "We've had a few discussions and we're pretty close to signing our overseas player - that announcement won't be far way," he said. "It should be in the next month or so, and there are a few other irons in the fire that might be released shortly as well."